Treehouse is a novel idea for mobile meetings and brainstorming! These mobile pods are available in a range of wooden and fabric covered carcass and with a variety of fabric upholstery options. Featuring lockable castor wheels they make private and informal meetings possible anywhere. Pretty is a modern and delightful Italian chair versatile to be used in restaurants, waiting and meeting rooms, offices and even in the home itself. Pretty has an invitational curved back rest atop a sturdy yet elegant leg frame it oozes design and comfort. 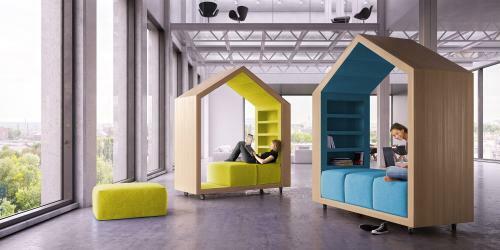 The new Cave range is a flexible modular solution for making collaborative spaces private and informal. AXY is a range of stylish meeting room tables with angled leg frames which are simple yet striking. A comprehensive range of HPL and leg frame finishes makes this a versatile option for any meeting table requirement. At MSL we are curating an eclectic portfolio of exclusive contemporary office furniture, from a selection of European manufacturers. 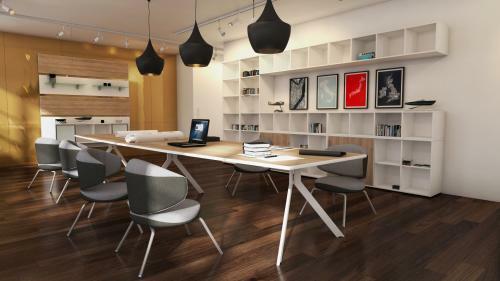 Our collection includes reception desks, executive and boardroom furniture, office workstations, seating and storage. Our services includes reception desks, workstations, seating and storage.